So the other day I went to a cafe and had a vegan gluten free soy free pumpkin spice muffin. It was amazing! I believe there was a little cross contamination involved because my stomach hurt all night. However, I have to say that it wasn’t a full blown attack and so that gave me hope. It made me realize that if I was able to make something similar at my house with no cross contamination then it would be so delicious and safe to eat! Disclosure: Some of the links below may be affiliate links. If you click through and make a purchase, I may make a small commission at no additional cost to you. Thanks for reading! 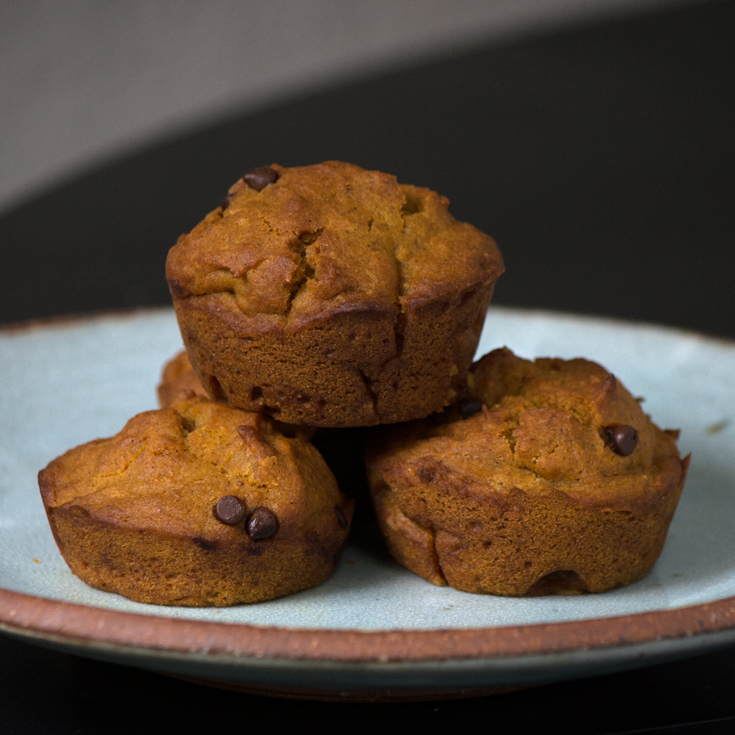 I have used pumpkin as an egg substitute before but not yet in muffins. So, I made some with both pumpkin and egg substitute, I used energy egg replacer, link here. And it seemed to really work! They were so soft and moist. They did not get hard like gluten free baked goods often do. To make them truly vegan you must use vegan chocolate chips like Enjoy Life brand, link here. I used Earth Balance soy free margarine to keep them soy free. I used Bob Mills 1 to 1 gluten free flour mix. (click the link to purchase on Amazon. )You can make your own mix of flours of course. It is just faster to use the premixed flours. For baking I have had a lot of success with Bob Mills 1 to 1 and I often find it on sale. I have noticed that soy and I are not good friends lately. Sadly this made me also discover that soy is in so many things! One of them being most butter substitutes. So I have been using the soy free margarine and coconut oil in everything. Thankfully there options! 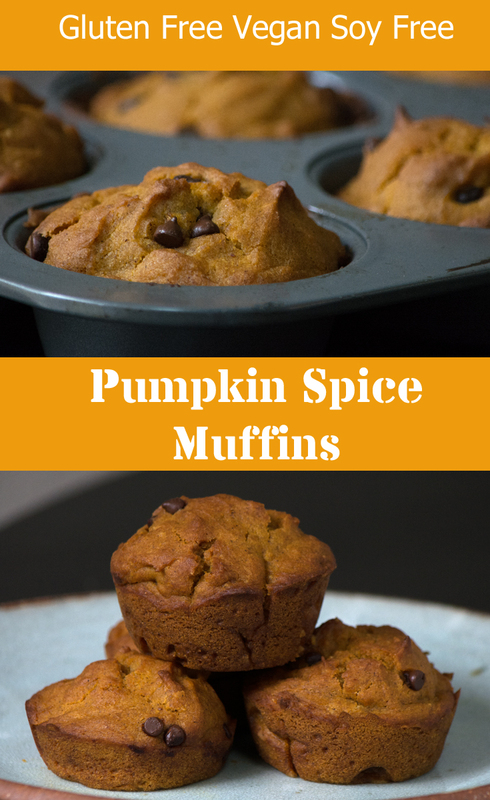 Pumpkin spice muffins are perfect for fall! They go great with a nice cup of tea or coffee. I greatly miss being able to just grab a muffin on the go. Thankfully these are very easy and quick to make. My four year old helped me and it still only took 40 minutes. Without assistance I believe it would have been around 35 minutes including baking time. Everyone loved them and no one could even tell they were gluten free. I am going to make them again this week! Make egg substitutes according to instructions on package, let sit for 5 minutes. Add wet ingredients, including pumpkin puree and mix well. Recipe makes 12 regular sized muffins. Distribute the mix evenly. Cook for 20 minutes and check with a toothpick. 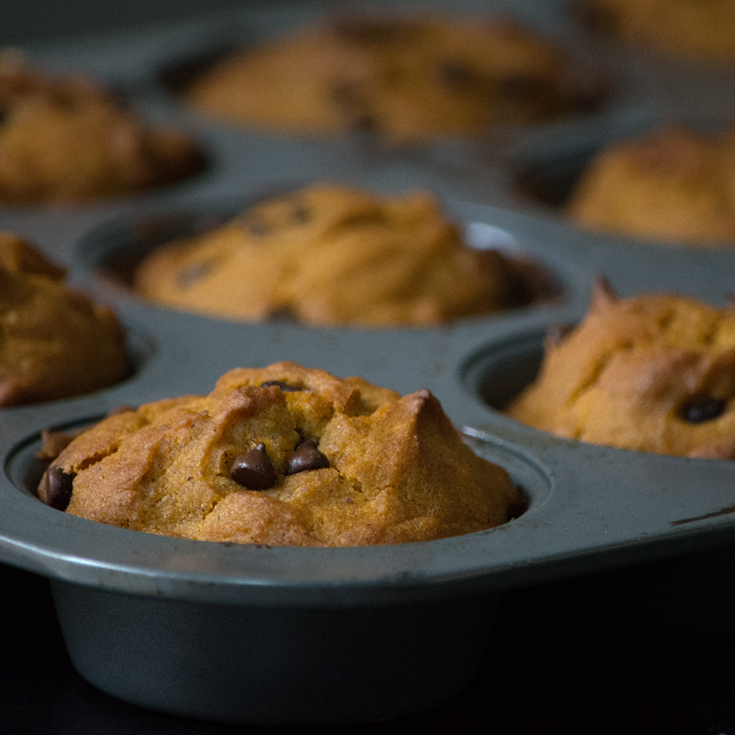 Click here to see my post on gluten free vegan mini banana muffins! 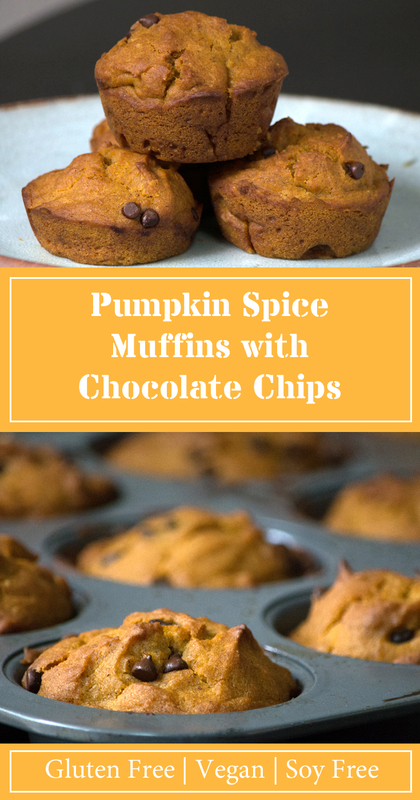 Pumpkin Spice Muffins with chocolate chips. Vegan, Gluten free, soy free.